This Big Wheel Clock features a large rotating wheel with hands free operation. The variety of exposed gears reveal the inner workings of a normal clock. With inspiration from the industrial revolution, the intricately-designed gear clock provides a classy and sophisticated look for any wall in your home or office. Each gear on the clock rotates as time passes. The outer sprocket tells the time, by using a simple arrow that points to the correct time. The large outer dial makes a full revolution twice a day. The bold numbers and 15-minute invterval markings are easy to read from a distance. The H.G. 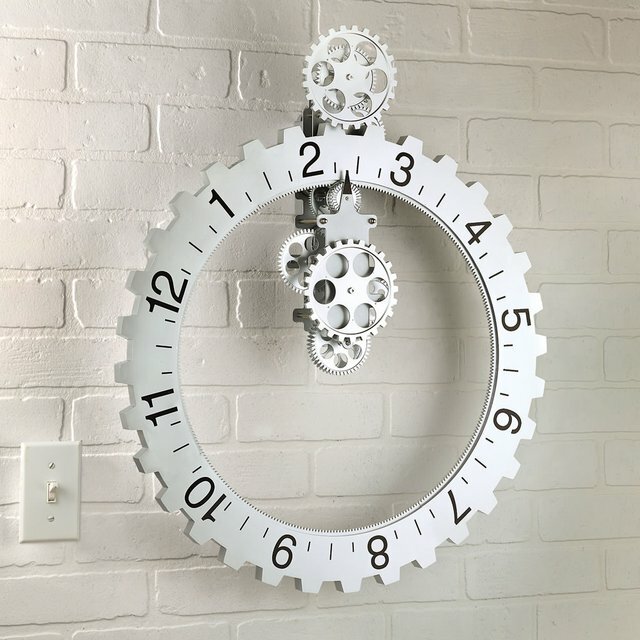 Wells time machine has nothing on this gear wall clock! Every clock measures 23 inches by 6 inches by 23 inches and weighs 2.7 pounds. Available in both white or black color options, this item is sure to complement any decor.